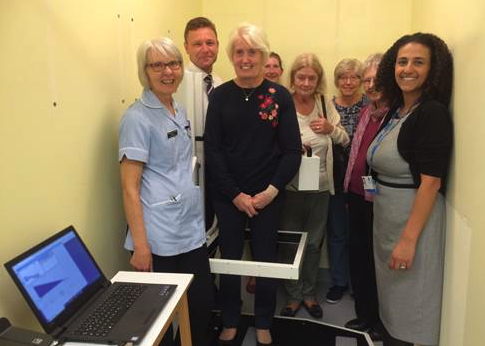 The Friends at Broomfield Hospital have kindly donated £10,000 to help fund a piece of equipment which is used to assess lymphoedema. On Wednesday, October 18, the perometer was installed at the St Andrews Centre gym and will benefit patients suffering from the chronic condition. The remainder of the almost £23,000 cost was met by the department. It assists clinicians to measure the swelling of the limb, caused by a collection of fluid in the body’s tissues. The condition develops when the lymphatic system, which helps to fight infection and remove excess fluid, does not work properly. It is often the result of cancer or cancer treatment. The perometer functions using photosensors and light-emitting diodes (LEDs) with which the limb is illuminated and scanned. The actual measuring unit is installed in the frame, which is pushed over the limb. Following staff training, the perometer will now be brought into use.